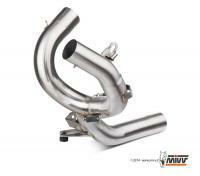 A range of Stainless steel lightweight Decat Exhaust pipes for many popular models. Let's your engine breath and sound like it was designed to. 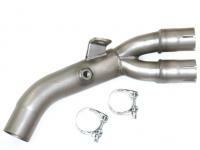 The catalytic converter (CAT) helps to convert carbon monoxide into carbon dioxide. It converts the hydrocarbons into carbon dioxide and water. It also converts harmful nitrogen oxides back into nitrogen and oxygen. The lambda or O2 sensor, is the key sensor in the engine fuel control feedback loop. The ECU uses the O2 sensor's input to control the amount of O2 in the exhaust gases and balance the fuel mixture, keeping it within a very narrow Air/Fuel ratio band of +/- 0.03% of 1.0 λ. The O2 sensor is fitted in the exhaust before the CAT, so removing the CAT will have no effect on the function of the O2 sensor. The current UK MOT test does not include a gas analyser check and as far as we are aware it will not be introduced in the near future.